The Chocolate Mixed Berry Smoothie may be my favorite, but there's also a special place in my heart for pumpkin. 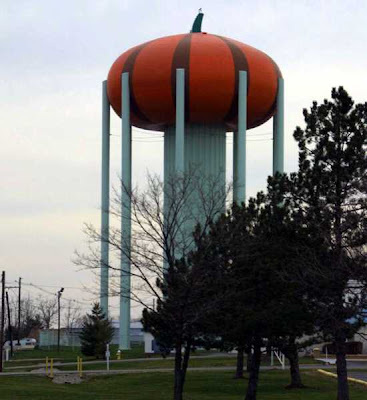 Circleville's pumpkin-love is even evident in the city's water tower. Since my mom never liked it, I grew up in a sad, pumpkin-less home and relied on The Pumpkin Show to get my annual fix. But now, I'm finally realizing that I can enjoy pumpkin more than just once a year. For me, this smoothie beats any pumpkin milkshake I've ever had at a fast food or ice cream chain. And without the mass amounts of sugar. In a blender (I use this single-serve one ), mix all ingredients except ice cubes until well blended. Taste and adjust spices as needed. Add ice cubes a few at a time until smoothie reaches desired consistency.